Tata Motor vehicles. And to accomplish this vision, TATA Genuine Parts has built a wide network of mechanics all over India and has established a relationship program called the TATA Guru Program. Under this program, every TATA Guru can earn points on the products purchased, and redeem these points to avail attractive gifts. 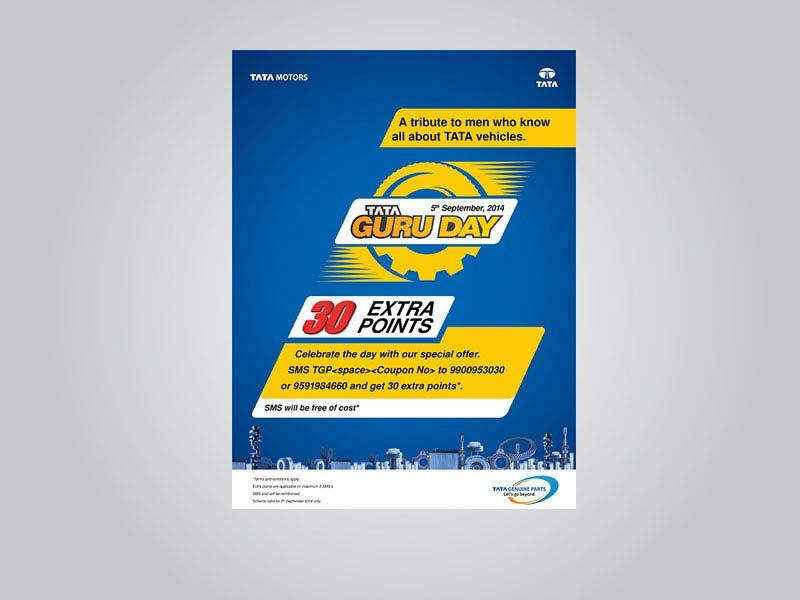 As a gesture of gratitude, TATA Genuine Parts decided to organize an event to recognize the contribution of TATA Gurus. The key responsibility of conceiving the event was entrusted to Collateral. After a long ideation session, we finally came up with the idea of celebrating 5th September (Teachers’ Day) every year as TATA Guru Day. This initiative would play a significant role in taking their association to the next level. A special offer was designed on purchase of every product to celebrate the joyous occasion. The task at hand was to communicate this event to the TATA Gurus. This is where the real action began. While posters, danglers, leaflets, banners, and badges were designed for the event, the requirement for these collaterals rose to over 2 lakh quantities. And the biggest challenge was to deliver all these collaterals in just one week. The task was tough and daunting, but Collateral refused to quit. Putting all our forces together and working towards a single goal, we spent sleepless nights at our workplace while the country was celebrating the long weekend of Ganesh Chaturthi. But at last, all our hard work proved fruitful. The entire batch was delivered on time. The event was a huge success. Once again, Collateral proved that it when it comes to turnaround time, we go every length to fulfill our commitment.